There are many different types of vision problems that could be affecting your eyesight. We will be focusing on the most common causes of impaired vision. These, along with many other vision impairments, are treated with care and precision by our eye care providers. MYOPIA (NEARSIGHTEDNESS): Nearsightedness, medically known as myopia, refers to vision that is good at close range but not at a distance. It generally occurs because the eyeball is too long or when the cornea has too much curvature. This increased distance between the cornea and retina, causes light to converge in front of the retina, rather than on it. Nearsightedness is diagnosed during routine eye exams and possible treatments include eyeglasses, contact lenses, LASIK (laser-assisted in situ keratomileusis), PRK (photorefractive keratectomy), and acrylic corneal implants. Because myopia is associated with an increased risk of serious sight-threatening conditions, such as myopic macular degeneration, retinal detachments, cataracts, and glaucoma, it is important to implement MYOPIA CONTROL methods at an early age, thereby reducing the risk in the future. HYPEROPIA (FARSIGHTEDNESS): Farsightedness, medically known as hyperopia, refers to vision that is good at a distance but not at close range. Farsightedness occurs when the eyeball is shorter than normal or when the cornea has too little curvature. This reduced distance between the cornea and retina, causes light to converge behind the retina, rather than on it. If you are mildly farsighted, your eye care provider may not recommend corrective treatment at all. However, if you are moderately or severely hyperopic, you may have several treatment options available, including eyeglasses, contacts lenses, LASIK (laser-assisted in situ keratomileusis), and PRK (photorefractive keratectomy). ASTIGMATISM (FOOTBALL-SHAPED EYES): Astigmatism is an uneven or irregular curvature of the cornea or lens, which results in blurred or distorted vision. Other symptoms of astigmatism include the need to squint, eye strain from squinting, headaches, and eye fatigue. In reality, most people have some degree of astigmatism, which is usually present at birth and is believed to be hereditary. In minor cases, treatment may not be required but is certainly beneficial. Moderate to severe astigmatism can be treated with corrective eyewear, contacts lenses, LASIK (laser-assisted in situ keratomileusis), or PRK (photorefractive keratectomy). 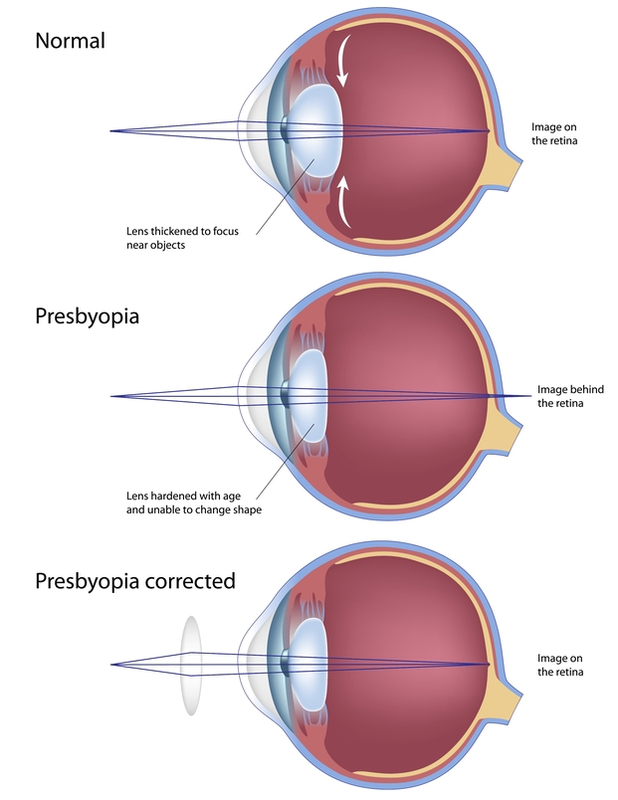 PRESBYOPIA (AGING EYES): Aging eyes, medically known as presbyopia, is a condition in which the lens of the eye gradually loses its flexibility, making it harder to focus clearly on close objects, such as printed words. Distance vision, on the other hand, is usually not affected. Unfortunately, presbyopia is an inevitable part of aging and cannot be prevented by diet, lifestyle, or visual habits. However, it is treatable with several types of corrective lenses, including progressives, bifocals and trifocals, single-vision reading glasses, multifocal contact lenses, and monovision therapy. STRABISMUS (CROSSED EYES): Crossed eyes, medically known as strabismus, refers to a condition in which eyes are misaligned. It commonly occurs when the muscles that control eye movement are not properly working together. The result is one or both eyes turning inward, outward, upward or downward, or one or both eyes moving irregularly. Strabismus is usually diagnosed during childhood and affects about 4 percent of children, afflicting boys and girls equally. Though it cannot be prevented, its complications can be avoided with early intervention. Even if you notice symptoms intermittently – when your child is ill, stressed, or fatigued – alert your eye care provider. AMBLYOPIA ("LAZY EYE"): "Lazy eye," medically known as amblyopia, is a loss or lack of development of vision, usually in one eye. This degenerative process usually begins with an inherited condition and appears during infancy or early childhood. Lazy eye needs to be diagnosed between birth and early school age since it is during this period that the brain “chooses” its visual pathway and may ignore the weaker eye permanently. Lazy eye is not always easy to recognize since a child with worse vision in one eye does not necessarily have lazy eye. Because of this, it is recommended that all children, including those with no symptoms, have a comprehensive eye examination by the age of three and sooner, especially if there is a family history of any eye condition or disease. 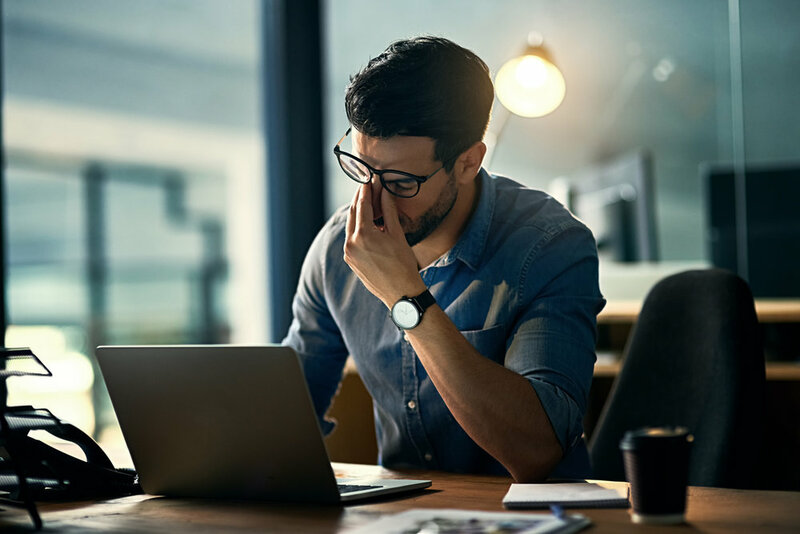 COMPUTER VISION SYNDROME: Computer Vision Syndrome is characterized by neck pain, blurry vision, stiff shoulders, headache, and watery eyes when working in front of a computer screen. The symptoms are typically due to posture, dry eyes, eye muscle coordination, and poorly corrected vision. Since computer monitors are typically 20 to 26 inches from your eyes, your regular eyeglasses may not be the best option for computer work. This distance range is considered intermediate – closer than what you use to drive a car but farther away than what you use to read. Special lens designs for computer work provide you with a larger intermediate area for viewing the computer and your immediate work area like the top of your desk.